MetaMoJi are pleased to announce that they making 7notes, their popular digital notes application for iPad, iPhone, Android and Amazon Kindle Fire, more easily available to a wider audience. MetaMoJi have taken full control of the 7notes development and marketing strategy and are working to deliver a high quality handwriting experience to more tablet and smart-phone users across the world. The cost of 7notes for Kindle Fire will be reduced from $9.99 to $0.99 starting from February 23rd. 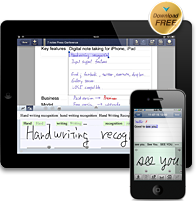 The 7notes proprietary state-of-the-art handwriting recognition engine allows users to take notes on the go, using their fingers or a pen, and easily switch between handwriting and keyboard entry with a single touch. A state of the art prediction engine helps to deliver an extremely high recognition capability “out of the box”, with no learning process needed. Notes can be saved as different formats and stored or shared through Dropbox and Evernote. If you would like more information on how use 7notes to benefit your organization, or to enhance an existing solution or product, then please call us on +1-631-244-1466 or visit our website for more information and contact options.